The Fair is just around the corner! Can you believe it? 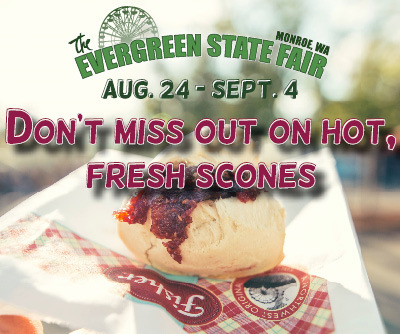 The 2017 Evergreen State Fair is just around the corner. Don't miss out on our discounted admission! Buy before August 24th and save! In 1964 a group of Morgan horse owners in Western Washington gathered to “form a social group” whose common interest was to enjoy their horses. From these very simple beginnings came the formation of The Morgan Horse Club of Washington State, Inc. The club was incorporated on April 12, 1971 with the purpose of joining Morgan owners, breeders and enthusiasts from all over Washington to promote, understand and appreciate the Morgan horse. Since then, we’ve created horse shows, award programs, affiliate youth clubs, a Tree Farm Association to encourage trail riding, and a year-round schedule of activities to both promote and enjoy our Morgan’s. 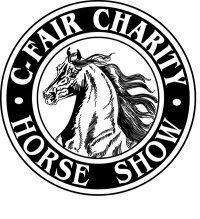 Check out their website for more details on their club & the C-Fair Horse Show. 100 Percent of proceeds benefit the AQHA Region One Scholarship Fund. The Regional show is approved for points for year end points for Oregon and Washington State Quarter Horse Association. The Novice Show is approved by WSQHA for YEA. The Extreme Mustang Makeover will travel to Washington in the summer of 2017! Adult trainers, ages 18 and over, will compete in this 100-day wild horse training competition with their assigned mustang in a series of preliminary classes for a spot in the Top-10 freestyle finals performance. This event will award $25,000 in cash and prizes. All adult mustangs will be available for adoption after the finals performance via public competitive bid. Representatives from the Bureau of Land Management Wild Horse & Burro Program will be on site to approve interested adopters. This EMM event will be held at Evergreen State Fairgrounds. Pick up for mares ages 4-7 will be on April 28-29 in Burns, Oregon. Applications are due March 27, 2017. On Saturday, August 19th for an exciting evening of freestyle competition and adoption! All events throughout the weekend are free except for the freestyle finals performance. Tickets may be purchased in advance or on-site Call for more information. 2017 Evergreen State Fair …Harvest the Memories! 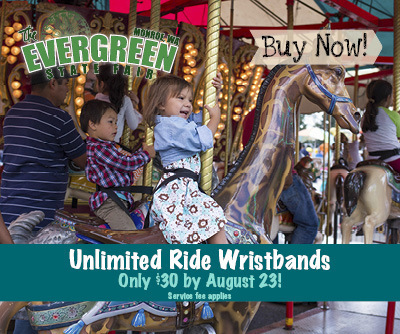 The 2017 Evergreen State Fair we have it all; Concerts, Carnival, Demo Derbies, Great American Petting Zoo, Crazy Animal Races, Logger Show, Auto Races, Pro-West Rodeo, Contests, Exhibits, Vendors, delicious food and so much more. Buy tickets and carnival wristbands early and save!! 9/4 Labor Day~ $2 off Admission for everyone Fair closes at 9:00 pm on Labor Day. 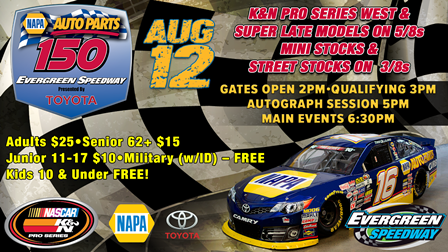 Specials apply to Fair Gate Admission only • Prices are subject to change without notice. 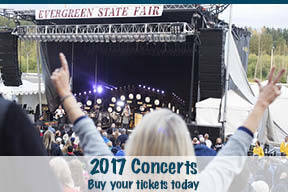 for KING & COUNTRY (Christian) August 28 7:30 p.m.
Josh Turner August 29 7:30 p.m.
Joan Jett & the Blackhearts August 30 7:30 p.m.
Kenny Loggins August 31 7:30 p.m. Trace Adkins September 1, 7:30 p.m.
Evergreen Drift August 13th Open Drift! Race With Rusty Racing Experience at Evergreen Speedway! Evergreen Drag Racing- Friday August 18th, 2017! Buzz Inn Steakhouse Stinger 8 Nationals-Eastside Corvette Club ELVIS NIGHT! Carnage Fest During the Evergreen State Fair Presented by Angel of the Winds Casino! Rock 98.9 Figure 8 Mania During the Evergreen State Fair! 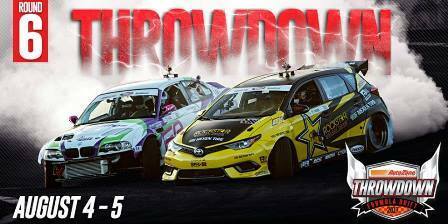 Evergreen Drift ProAm and Grassroots Round 4! Evergreen Drift Powered by BARDAHL During the Evergreen State Fair!